Here is our latest investment in machinery at Thomas Brown Engineering, the Sunnen Power Stroked Honing Machine. This machine is a great addition to our tool room capability as it can produce work faster and with greater accuracy and consistency than I.D grinders, especially in smaller diameters. 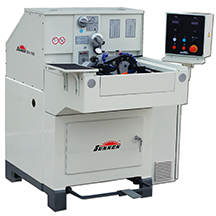 The quality of a finished component is greatly enhanced by this machine as it assures constant stroke length and stroke rates. It also controls bore size, finish and geometry better than ever before, even at high production rates. Its ability to rough and finish in one operation on many jobs will ensure we can provide the excellent quality finish to parts that our customers expect at a cost effective price.